Lauren is totally dedicated to helping you become the best and safest driver. 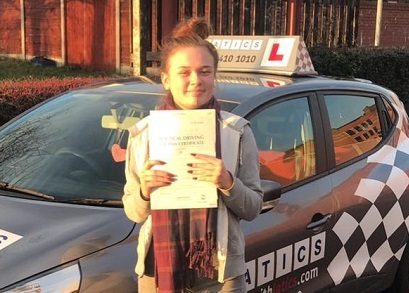 Lauren has been teaching people to drive since 2017 and her up-to-date teaching methods will help you feel totally prepared for your test and driving solo after passing too. She creates a calm learning environment and is totally supportive to your needs. 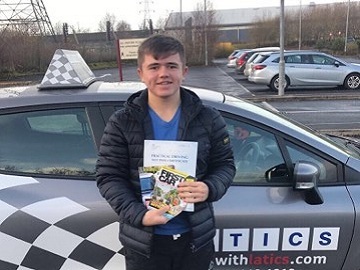 You’ll really enjoy your lessons, right up to when you pass your test! Item I can’t live without: GHD straighteners! Favourite quote: If it doesn’t challenge you, it won’t change you! If I won the lottery I would… Go on a lifelong holiday! Lauren gives driving lessons in Castleton, Rochdale, Middleton, Chadderton, Royton, Shaw and Failsworth. “In September 2018 I decided to learn to drive, to stop paying my wage to an Uber driver called Clive! Without a second thought I rang the teacher who gave me a lesson and wasn’t a preacher. “I can’t thank Lauren enough for all the help and advice she has given me over the past months on my driving lessons. When starting my lessons, I was a little nervous as I had never driven a car before or met my instructor! Straight away Lauren made me feel comfortable and safe and explained everything to myself clearly. She is such a nice person and I could genuinely tell she wanted the best outcome for myself and she wanted to make sure I was a safe driver and understood everything I needed to know about being a safe driver. “I would like to say a HUGE thank you to Lauren Crossley for being so patient, understanding, having a great vibe, calm and also great company to be driving with. I will miss it! Lauren went far and beyond in helping me build my confidence on the road, learning how to drive and to pass! This made my whole driving experience amazing. I would recommend Latics to anyone! Lauren & the whole Latics Team are very professional and will do the most for you, which I am grateful for. 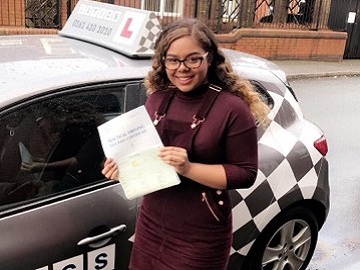 “Thank you so much to Lauren for not only helping me pass first time but also building my confidence so I feel comfortable drive in real life! Lauren constantly made sure not to just teach me how to pass the test, but also how to do every day driving and thanks to her, I have been able to start driving straight away. Aside from being a fantastic instructor, with tons of patience and understanding, she is an extremely lovely person who is so easy to get on with too! “I had Sanam as my first instructor, she helped me to keep motivated as she taught me how to advance with my driving. Her teaching techniques allowed me to keep focused and gave me a sense stability when recalling how to deal with certain situations. I would be lost without her patience and consistency as she continued to coach me. Sanam taught me how to drive and never gave up on me, for this I am eternally grateful. Lauren was my second instructor, within her lessons she gave me a sense of safety. Mistakes were embraced, and she taught me how to stay calm and deal with situations. Areas I would usually struggle with, such as roundabouts, she helped me defeat. I am no longer afraid of driving and this sense of calmness gave me the confidence to continue. Lauren helped me come out of my shell as she consistently pushed me to become a better driver. Like Sanam, Lauren never gave up on me. They continued to coach and believe in me. Sanam taught me how to drive and Lauren taught me how to access my confidence, which enabled me to be calm and comfortable in situations. “Thank you, Lauren, for helping me pass my test first time! Would highly recommend Lauren and Latics Driver Training to anybody wanting a welcoming environment to learn how to drive in. Lauren is very dedicated and really works hard to help you pass and become a safe driver! Friendly and fun and makes you feel comfortable during lessons. 1st time & 1 fault! 1st time & 3 faults! Fantastic 1st time pass Beth!